OFF: the light will turn off. Auto: light up automatically only when the motion or body heat is detected in dark areas and light off automatically after no action for 20 seconds. . If any questions,please feel free to contact us .We are always here to be helpful. 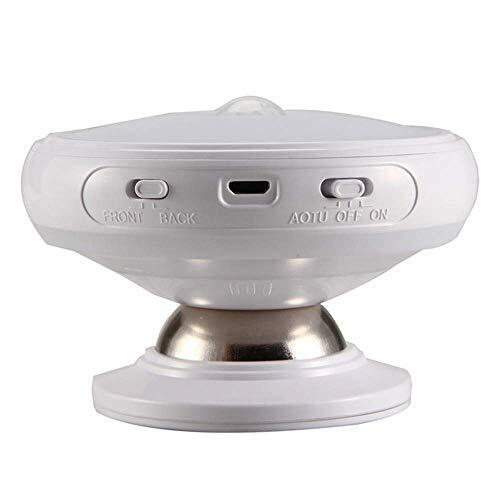 ❤【360 Degree Rotation Night Light】 - Adjust the night light to a suitable angle with the 360 degree rotation body, so you can avoid the light direct to your eyes,Even you can select to turn on the back light instead of the front light. ❤【Motion Sensor Light】- Dusk to dawn sensor and motion activation,Automatically turn on when motion is detected within a 7-10 ft. range. ❤【Rechargeable Night Lamp】- Usb cable included,Please charge the rechargeable type light for 2-5 hours before first use，when fully charged, it's indicator light will turn blue from red. ❤【Automatically Turns Off 】 - After human body leaves the sensing range about 20 seconds with AUTO mode in the darkness, it automatically turns off. ❤【Easy Use】 - No outlet needed,Stick the night lights to anywhere: bedroom, bathroom, stairs, hallways, closets, cabinets, kitchen, nursery with the double-sided adhesive pads included in the package.